Did Humans and Dinosaurs Live at the Same Time? In a way, it doesn’t much matter to me whether humans and dinosaurs lived at the same time. I guess the question interests me intellectually, but I don’t think I have an ideological investment in it. 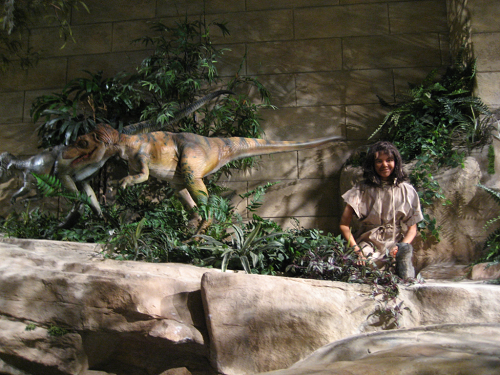 An exhibit at the Creation Museum shows a human happily coexisting with a hungry-looking theropod. Source: Wikimedia Commons. Here’s how it does interest me: I’m writing fiction that is set in the remote past, during a period when the written history is sketchy. The first novel for my Edhai series is called The Cursed Ground, and the first episode is due for release on Jan. 20, 2015. The concept calls for a lot of world-building, and it could be interesting to portray some interaction between the human characters and some large reptile-like or large bird-like animals. But does it make any sense to build a fictional world in which humans are contemporary with dinosaurs, especially for a fiction series that is purportedly “historical”? How you respond to that question could depend on your ideological stance. A creationist (by which I essentially mean a young-earth creationist) would say, ‘Of course humans and dinosaurs lived together.’ That view holds that the earth and all life on it are only about 6,000 (or sometimes 10,000) years old. Artwork and even museum exhibits from that camp sometimes show humans and dinosaurs in the same scene. A materialist would say it’s nonsense to place humans and dinosaurs into the same time frame (materialists love the word “nonsense”). Dinosaurs, at least what most people think of as dinosaurs, lived in the Mesozoic geologic period, according to the timeline most-commonly accepted in mainstream academia. That period is said to have ended 66 million years before the present (b.p. ), whereas anatomically-modern humans are only supposed to have appeared within the last half-million years — too late to have ridden a triceratops or to have had to run away screaming to avoid getting stomped-on by a T-Rex. That said, some intriguing scientific findings in recent years have called into question some long-held assumptions about when the non-avian dinosaurs actually lived. Could the consensus time frame be off — even way off? And could that triceratops horsey-ride have been feasible after all? 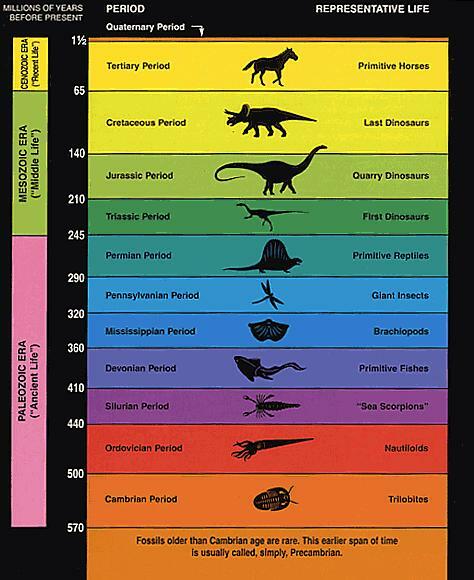 Conventional geologic time scale. Credit: U.S. National Park Service. Organic material found in a T-Rex fossil: Paleontologist Mary H. Schweitzer Of North Carolina State University stunned the fossil-hunting profession with her 2005 article in Science, “Soft tissue vessels and cellular preservation in Tyrannosaurus rex.” In her article, Schweitzer reported finding organic tissue in the femur of a Tyrannosaurus Rex fossil. The problem is that, according to the current model of how fossils form, there’s no way any organic material should have remained in a fossil 68 million years old. Any such material should have long ago decomposed and been replaced by minerals, or have been destroyed by radiation. Many critics claim that her sample must have been contaminated somehow. Schweitzer seems to think that the material really is 68 million years old and that this suggests that current theory about how fossils form might be wrong. That’s a useful idea, but another possibility is that the conventional means of dating fossils is way off, and that the T-Rex in question lived much more recently than is called for in the prevailing view of the geologic past. Radiocarbon dating finds dinosaur fossils only 22,000-39,000 years old. Traditional paleontologists would never think of applying radiocarbon (RC or C-14) dating to Mesozoic fossils. After all, C-14 dating is only useful going back 50,000-80,000 years b.p., three orders of magnitude too soon. Yet an open-minded group of researchers (calling themselves the Paleochronology Group) decided, Why not? The tests have yielded ages between 22,000 and 39,000 years b.p. for fossils of Allosaurus, Triceratops, Hadrosaur, and Apatosaur. Critics argue that these RC dates can’t be correct, because the non-avian dinosaurs studied all died out 66 million years ago. In other words, these findings are not in line with the consensus view, so they must be wrong. The Paleochronology Group argues that the conventional potassium-argon method used to obtain the very-old dating of Mesozoic fossils tests the supposed age of the surrounding deposits, not the fossils themselves. Anyway, these are intriguing findings, and the controversy over them reveals a tendency to deny anomalistic evidence, findings that don’t fit the prevailing paradigm. Such denialism can particularly manifest if critics have an ideological bias that requires a very, very long time frame for life on earth, a long enough time frame for chance and necessity to supposedly produce a vast diversity of life. As atheist champion Richard Dawkins once said, “Darwin made it possible to be an intellectually fulfilled atheist.” (The Blind Watchmaker, 1986) Intellectual fulfillment does not die easily. Anyway, those two sets of findings by paleontologists are suggestive of the possibilities for a novelist writing historical fiction based on Biblical settings. With some speculative elements thrown into the scenario, it might be possible to let some of the human characters encounter some strange and dangerous beasts. In fiction, the anomalous can make for good storytelling. By the way, if you enjoy reading articles like this — and if you want to keep up with news about my historical-fiction series, The Edhai — please sign up today to receive my free email newsletter. Atheist philosopher Daniel Dennett recently published “Seven Tools for Thinking” in The Guardian. 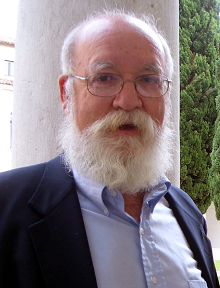 An excerpt from his new book, Intuition Pumps and Other Tools for Thinking, Dennett’s seven tools make up a useful set of guidelines for some aspects of rhetorical arguments. 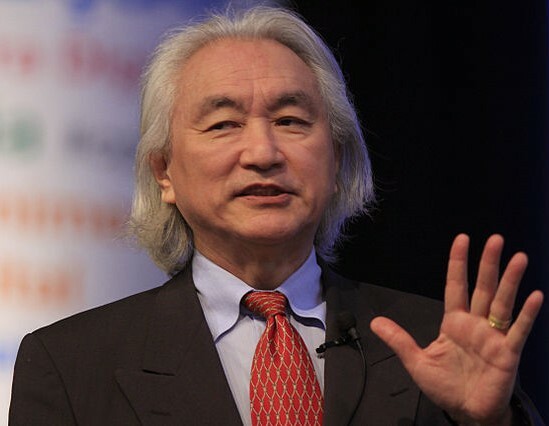 One of the least impressive attempts to apply Occam’s razor to a gnarly problem is the claim (and provoked counterclaims) that postulating a God as creator of the universe is simpler, more parsimonious, than the alternatives. How could postulating something supernatural and incomprehensible be parsimonious? Did you notice his rhetorical question? Dang, I almost wonder whether this is calculated to somehow entrap the unwary theist into a debate, because I would say Dennett’s use of a rhetorical question at that point represents the “author’s eagerness to take a short cut” and spotlights “a weak point in the argument.” Having in the previous section been sensitized to rhetorical questions, I find myself reflecting on Dennett’s linking of the four key words: postulate, supernatural, incomprehensible, parsimonious. What does his selection of these words indicate about his thinking, his biases, his rhetorical purpose, and the weakness of the argument implied in his question? Here is a good habit to develop: whenever you see a rhetorical question, try – silently, to yourself – to give it an unobvious answer. If you find a good one, surprise your interlocutor by answering the question. I like that idea. If I were to answer the rhetorical question, “How could postulating something supernatural and incomprehensible be parsimonious?,” how would I do so? An interesting exercise. One answer might be to focus on the weakness inherent in that question, the assumption that a supernatural being is incomprehensible. Another answer might be that evoking God as as creator of the universe is parsimonious if it happens to be true. In any case, hats off to Dr. Dennett for putting together a thought-provoking set of rhetorical guidelines. Sometimes you hear people say that God created other beings because he was lonely, but that makes little sense. Today I ran across a comment about 1 John 4:8, which says that “God is love.” In other words, that is his main quality, the essence of his being. The comment I read was, “Jehovah became the Creator as an expression of his endearing quality of love.” That makes more sense. The thought that comes to me, then, is that God created the universe and other intelligent creatures out of his love for everything and everyone that could come to exist. A recent story from BBC News emphasizes how difficult it can be to pick out the science from the hype when reading science news reporting. The article, “Woolly mammoth extinction ‘not linked to humans’,” explains some recent research by a Durham University professor based on a computer simulation of climate change over the last 42,000 years, and how this would have affected vegetation. This sounds pretty interesting, but what struck me more than anything was the way the results were reported, certainly by the BBC reporter, possibly by the researchers as well. The article says that the reason for the mammoth’s extinction has been controversial. Some scientists claim it was climate change, others that it was encroachment by humans. Others have rolled in the beloved deus ex machina of a meteor strike. Now, according to the BBC writer, “that debate has been settled.” Case closed! Congratulations on your latest sensational science story! What our results have suggested is that the changing climate, through the effect it had on vegetation, was the key thing that caused the reduction in the population and ultimate extinction of mammoths and many other large herbivores,” he said. “Our results have suggested…“? Humans have been exonerated and debates have been settled based on … ‘suggestions’? Certainly a computer simulation of climate change and its affect on vegetation is interesting and useful, but it’s really just one piece of scientific evidence. And, like any computer program, a simulation is subject to one of the basic limitations on any computer program: Garbage in, garbage out. Not that the simulation is wrong, but it could be, especially if it is programmed based on erroneous assumptions. When reading science news reporting, or original scientific research for that matter, it’s important to realize that it’s difficult to prove definitively what happened in the past. And the further in the past the events in question, the harder it is to prove anything, without written records by reliable observers. Digging up bones, fossilized pollen, or pottery shards from the ground is valuable work, as are analyzing DNA and running computer simulations. 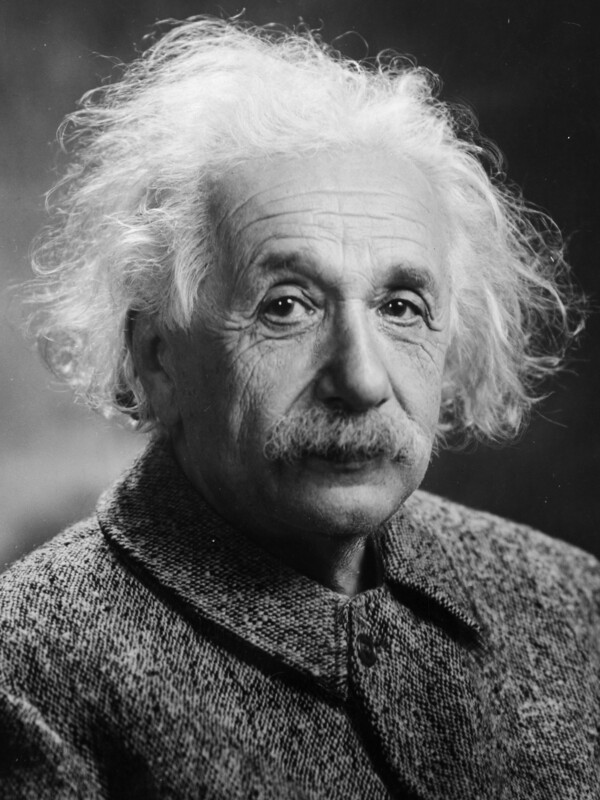 But the interested reader needs to keep in mind that scientists (and the journalists who write about their work) have skin in the game in one way or another — whether that be professional ambitions, funding to attain, reputations to uphold, or just plain personal ideologies to justify. I wanted to let readers know about my new Bible Student’s Quiz Book just published. It’s now available through Lulu.com and should be available soon through Amazon.com and other retail outlets. The book is published in print form and as a download.